It’s been raining, almost continuously, and it’s the dry season. The days rise and flow backwards—twenty minute sun patch, then deluge, rinse, repeat. Seasons are late, or early, in-between, inverted, slammed together unpredictably. Unless you count the warnings. And now it can’t stop crying. This jungle on fire, flooding and torn, weeps; crying to elicit compassion and guilt, shedding tears to signal and save a relationship in distress. Yet perhaps this strange rain is an auspicious tactic, a pouring portent. A response, and an invocation—both immunological, and emotional. For with rains, come frogs. 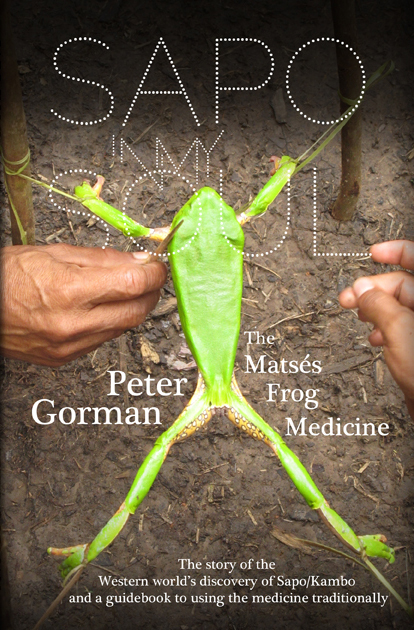 If ayahuasca is swimming in the rivers, lakes, dreams and streams of contemporary culture, then the frog is perched on a branch overhanging the water’s edge. Waiting and watching, its tadpoles dropping from a jelly-leaf-nest, into the current below, into our bloodstream. And it’s come on rapidly. Deeper still, beneath the surface, above and beyond it, is the amphibian spirit, archetype, and energy—a force of nature that teaches how to move, thrive, and communicate through and across different modes of existence, different worlds, with grace, ease, stealth, and song. The word Amphibian comes from the Greek amphibios—amphi “of both kinds” + bios “life” or “having a double life.” The frog is shamanism embodied, traversing vantage points both material and ethereal for purposes of survival, action, health and healing. And frogs are amazing. They eat with their eyes, breathe through their skin, and are considered the ultimate bio-indicators: species that can be used to monitor the health of an ecosystem. Interesting then that sapo/kambo emerges and spreads in this planetary moment with such powerful medicine, one well regarded for, among many other things, strengthening and upgrading the fight-or-flight response—encouraging grace under pressure. 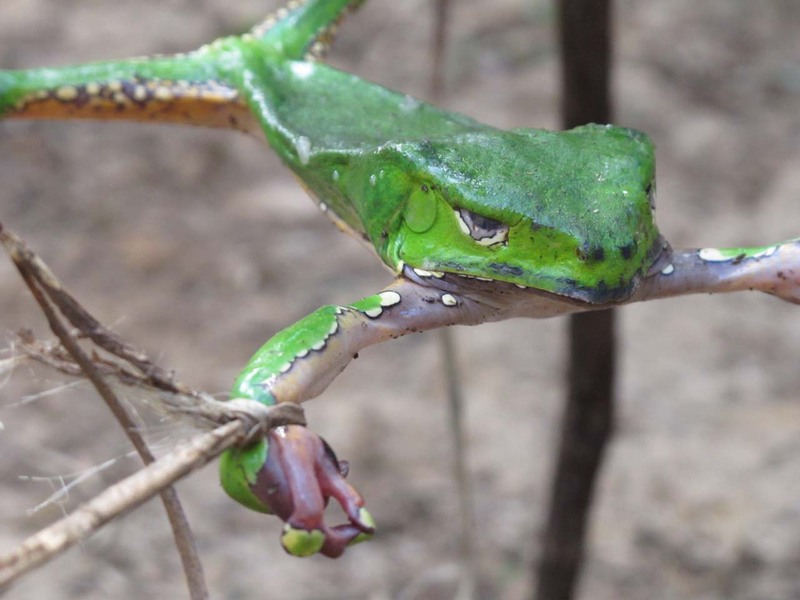 Yet another example of the frog’s ability to bring calm and balance opposites. A quality of particular significance and advantage now, in this era of ecological crisis. Dissecting the frog further: Cut open Phyllomedusa and you’ll see phyllo means leaf, while medusa means guardian, and is of course the snake-haired Gorgon of Greek myth (rather than turning you to stone, Phyllomedusa animates you). Bicolor of course means “two colors,” a nod to the inherent “double life” of the frog. So here we have with us, alongside us, and inside us, a leaf-loving guardian with snakes (ayahuasca) for hair, that guides, protects, clarifies, strengthens and sharpens health and senses, and by extension, one’s environment. Everything about dow-kiet! illustrates duality into multiplicity, in resounding chorus, from all directions —and beyond. It is quick, clever and slippery, not easily pinned down. Grab at it, and you might get shocked. Relate with it, and you’ll get further, faster. It is venom and it is medicine. It is frog, “toad,” and snake. It is saliva and it is water. It is well researched and completely mysterious. It is magic and it is science. The human body recognizes it instantly, while our culture often mistakes it for something else. In water, in trees, on land—it is fluidity and unity. It is the sacred secretion of the Matsés, the cat people, now spread eagle. Happens fast, feels like forever. It is sapo, and it is kambo. It is the Amphibian, in our bodies, souls and worlds.